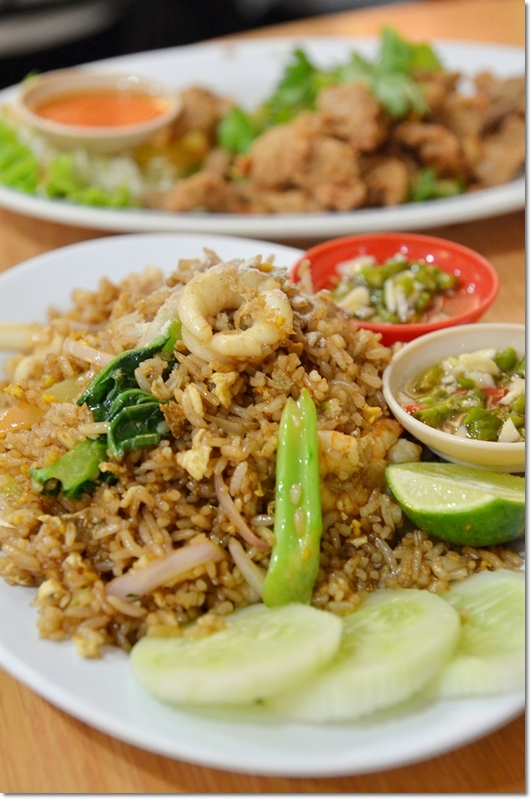 Thai Style Fried Rice (RM7/USD2.30 for small portion) – With prawns, squid, eggs, onions and stalks of mustard greens; served with a piquant and slightly tangy condiment of chopped garlic and bird’s eye chillies in a sweet-spicy chili sauce. Thai cuisine has almost always never failed me. Especially in times of dire cravings and turbulent climates. You know what I mean. This inconspicuous restaurant in Puchong came into the radar not too long ago, when we dropped by Mek-T for some good old Terengganu classics. The former Mek-T, I might add. They have since ceased operations under further notice. What a waste. Chiang Rai Style Restaurant. Guess the signboard cleared things up explicitly; a northern Thai cuisine specialist within a neighbourhood dominated by Chinese restaurants (Leong Ya Indah, Kajang Sup Pedas and various ‘dai chow’ outlets)? Right on. 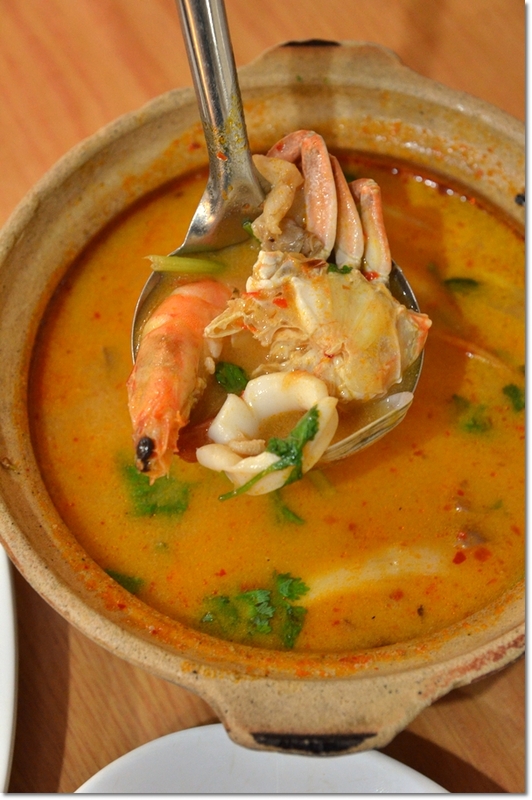 Thai Tom Yam Seafood (RM12/USD4) – A luscious claypot of creamy Tom Yam soup; laden with liberal hints of spices and a spicy tinge that won’t set the tongue on fire yet enough to tingle the tastebuds. The menu came in a laminated piece of A3-sized cardboard, with thumbnails for the uninitiated. Or the visually-inclined ones; can’t be bothered to read the descriptions. We settled for the usual …. Tom Yam Seafood served in a claypot, a serving of Fried Pork with Garlic and Thai-style of Stir Fried Petai (Stinkbeans) with Prawns, and coupled them off with a portion of Thai fried rice for two. They do serve an array of interesting dishes like Claypot Glass Noodles with Prawns, Minced Pork/Chicken with Basil and Century Eggs as well as a very seldom seen Raw Tiger Prawns with Thai Chillies, Mint, Garlic and Lime Juice (Gung Che Num Pa) and even fresh Australian oysters with lemon; at RM8 per piece. The dishes arrived within 5 or so minutes, and everything came within seconds from one another. We dig in into the fried rice with a slightly zesty flavour from the squeezed lime, and laden with sweetness from the prawns and squid. The Tom Yam proved to be worth its mettle; lending a nuance of subtle fire without torching the palate. The addition of ‘la-la’ clams into the broth added bites and a fresh perspective to the otherwise generic version in most stalls. 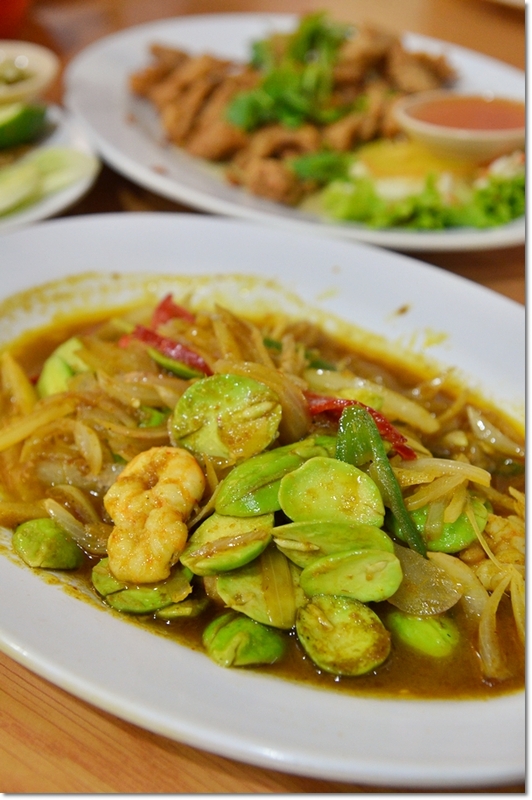 The Petai (stinkbeans, this author’s undying love for anything pungent has breached a feverish point!) with prawns and an unbelievable amount of chopped onions was delicious and brought back good memories from home. How I miss Grandma’s version, really. The meal for two came to RM50/USD17 inclusive of drinks. We did not have any white rice as the fried rice portion was suffice for two to share. Most of the dishes come in 3 sizes; depending on the number of diners and of course … dependent on YOUR appetite too. All in all, a place that I will not hesitate to recommend if you’re around Puchong and hankering for a good bite of Thai feast. And the Raw Tiger Prawns dish does sound alluring, in spite of the ‘fear factor’ of it all. 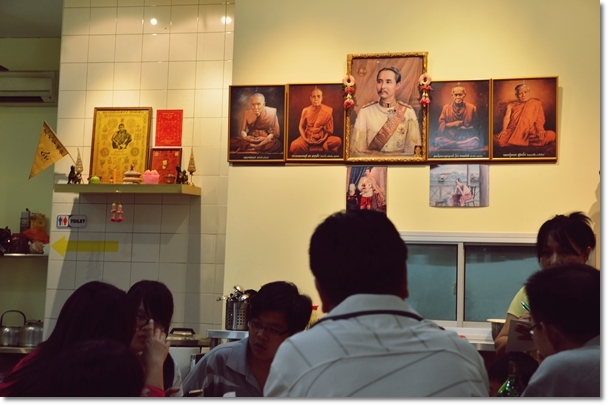 A good Thai restaurant in a neighbourhood visited by the residents within the vicinity I guess. Reasonable prices too. yes, this is the one previously located at Desa Aman Puri. the boss once told they will move to puchong. i miss the dishes alot, but till now stil have not chance to visit it again. Was there last week on a makan trip to KL. 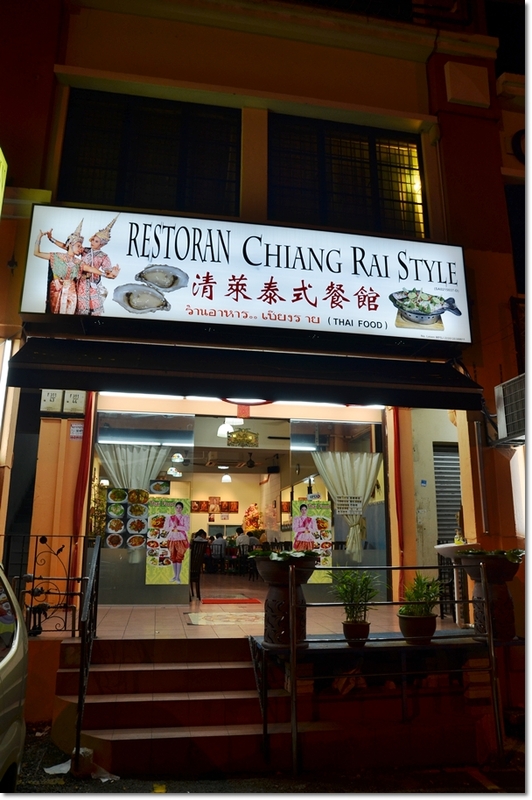 Again after reading the reviews gave a shot at this restoran . Was hardly impress with any of the dishes I ordered. The mango salad was too salty n lacked the required sweetness. 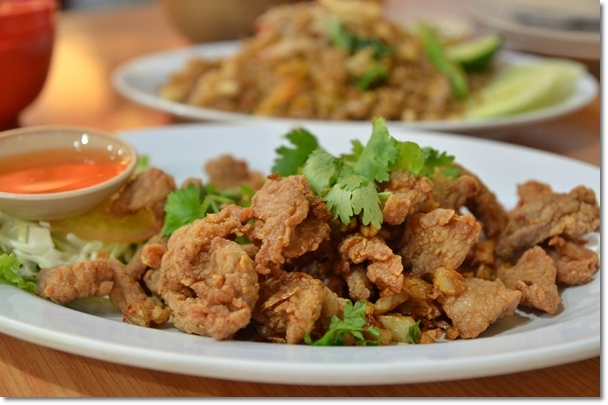 The fried pork with garlic was alright but ordinary . The stuffed chicken wings were no where crispy nor tasty. Lack seasoning . The fried thai noodles were too sweet .